At Koch Park Dental in Florissant, we provide comprehensive dentistry to all of our patients. Whether you come in for a checkup or a specific procedure, we are committed to providing you with personalized care. One of the things that we stress is the importance of dental health. Your dental health has a direct impact on your overall health. Many studies show there is a link between gum disease, for example, and serious health issues like heart disease. The nature of that connection is not fully understood. Nevertheless, you should come into our office every six months for a professional teeth cleaning. Some patients think that they do a good enough job at home: brushing, flossing, and water flossing twice a day, every day. But even the most rigorous dental health routine can’t prevent plaque from building up on the teeth. Plaque turns into tartar, and it’s important to have it removed. Every six months is a good habit to fall into. At Koch Park Dental we provide the teeth cleanings that promote good dental health, as part of our general dentistry. 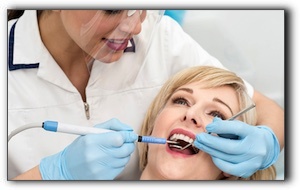 We also provide popular cosmetic dentistry procedures like teeth whitening and porcelain veneers. Schedule an appointment with us today, and we’ll keep you smiling.